We recently produced a “Vendor Fair” evening event for a local food service company based in Rosemont, IL. 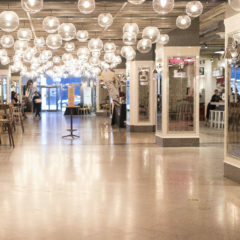 Their primary focus is on gourmet restaurants, trendy locations, and mom and pop style restaurants. 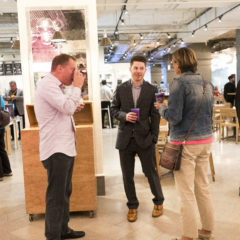 As part of their annual Vendor Recognition Conference, the “Vendor Fair” was held at Revival Food Hall, a popular food marketplace comprised of food stalls from 15 unique local Chicago restaurants. 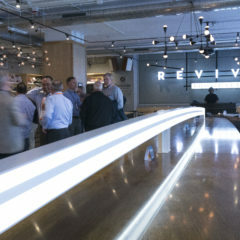 Located in the heart of downtown Chicago, in the Loop, Revival Food Hall is a popular Chicago event venue. The OTS team worked as a bridge between our client and Revival Food Hall to coordinate the use of their products in Revival stalls. The food service company provided charcuterie meats, fish, pizza dough, and other delicious items to showcase their products for vendors. Throughout the evening, 400 guests enjoyed indoor yard games, including giant Jenga and bag games. The event successfully highlighted the food products and kept guests entertained and networking throughout the entire evening. 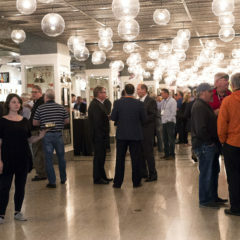 Thank you to Chicago Corporate Photography & Video for the great photos! On The Scene is an award-winning Chicago event management company. We have experience producing corporate events for a wide variety of clients in a number of industries. If you’re planning an upcoming corporate event in Chicago and need help with the coordination, logistics, transportation, event decor, and overall production, contact On The Scene today.